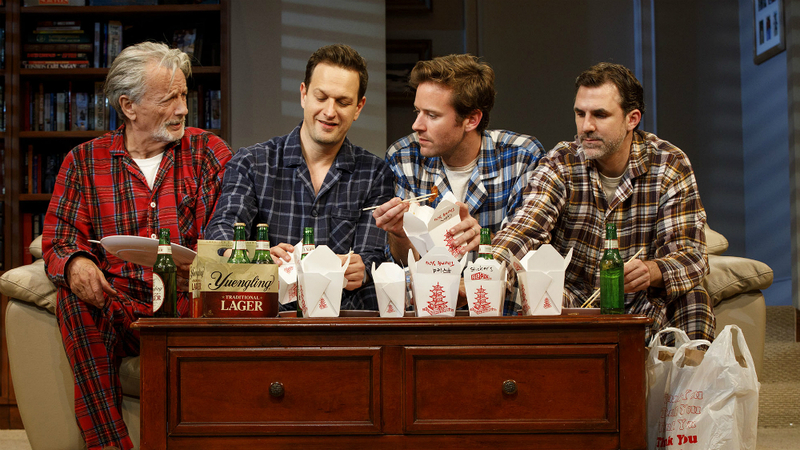 Young Jean Lee’s first Broadway play—and the first on the Great White Way by an Asian-American woman—Straight White Men is an intermittently funny but frustratingly uneven comedy that’s as blunt and unsubtle as a ten-ton weight dropped on our toes, starting with its jokey title. For 90 minutes, a widowed elderly father and his three grown sons engage in horseplay, casually racist, sexist and homophobic comments and general un-P.C. behavior during a Christmas visit at dad’s home. The brothers—the seemingly unambitious oldest, Matt, who has moved back home with their father, Ed; the arrogant middle one, Jake, who’s divorced from his black wife and has two young children; and the sarcastic youngest, Drew, who’s an aimless would-be writer—reenact juvenilia from their shared childhoods, making sure it annoys the others and conjures unhappy memories, along with telling NSFW jokes that show how they wear their privilege (the name they’ve given their family’s Monopoly board game) on their sleeve. That even includes Jake and Drew ganging up on their older brother for his being adrift in their eyes—if he doesn’t want to make real money, he must be a real loser, which to them is the ultimate curse word. Despite its obvious topicality, Lee’s play tries to have it both ways, indulging in the men’s entitled but mostly harmless behavior while purporting to satirize it. Some of her dialogue is amusing and pointed, but too much of it is variations on a single theme, and these diminishing returns—even with its short running time, the play feels hopelessly extended—call to mind an SNL skit that simply doesn’t know when to end. Blatantly underscoring the play’s façade as an epic take-down is gimmickry dreamed up by Lee and adhered to by her otherwise resourceful director Anna D. Shapiro. Before the show begins, raw, vulgar rap music—performed by the opposite of straight white men—is blasted into the auditorium, loud enough to bother the blue-haired ladies but not enough to cause consternation among those made of sterner stuff. Then non-binary performance artists Kate Bornstein and Ty Dafoe (playing Persons in Charge 1 and 2) come onstage for a tongue-in-cheek introduction to what unfolds in front of the audience for the next hour and a half. After they leave—and they return periodically to assist the actors during scene changes—we see a working-class living room set (imaginatively dressed by designer Todd Rosenthal) framed by a…well, large picture frame, with the play’s title on an engraved plaque at the bottom as if our characters are behind glass in a museum. It’s too bad that Lee never reconciles all the contradictions, contrivances and concerns that jostle one another, instead leaving them to fend for themselves. The machinations in the script are partially redeemed by the actors, who adroitly turn these cardboard cutouts into real people. 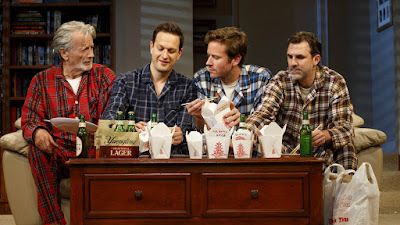 Josh Charles (Jake), Armie Hammer (Drew)—who makes a smashing New York stage debut, by the way—Paul Schneider (Matt) and Stephen Payne (Ed) earn laughs alongside their thoughtful portrayals that go beyond what Lee provides in her provocative but protracted play.